The enhancement of e-commerce is one of the important policy issues in the European Union. To this purpose the laws of the EU Member States should be further harmonised. The European Union has adopted a number of Directives relating to different aspects of e-commerce which should be implemented in the laws of the Member States. eDirectives: Guide to European Union Law on E-commerce provides article-by-article comments on four Directives central to the regulation of electronic commerce in the European Union (EU), viz. 97/7/EC on distance selling; 1999/93/EC on electronic signatures; 2000/31/EC on electronic commerce; and, 2001/29/EC on copyright in the information society. 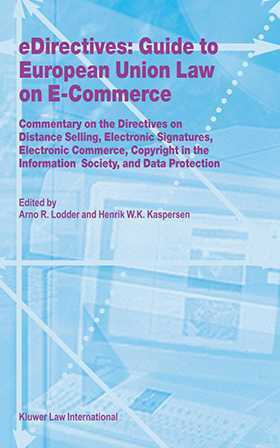 In addition, a separate chapter deals with e-commerce and privacy protection, while the opening chapter discusses all other EU initiatives relevant for the regulation of e-commerce. This volume is meant as comprehensive legal source of e-commerce legislation for both academics (LLM-students and academic staff) and practitioners (attorneys, company lawyers, consultants). It is not only of interest for readers in the EU-Member States (because their national law is or is about to be adapted to the EU Directives), but also for readers in aspirant Member States of the EU, as well as for readers in other countries where e-commerce has emerged, like the Unites States of America.